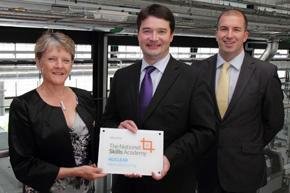 The new National Skills Academy for Nuclear Manufacturing has officially launched, with NES signing up as the first industrial member. The new centre is a collaboration between the Nuclear AMRC, National Skills Academy for Nuclear and manufacturing skills group Semta. It provides a single point of contact for supporting the skills requirements of manufacturers in the nuclear supply chain. Jean Llewellyn OBE, chief executive of the NSA Nuclear and NSA Nuclear Manufacturing (pictured left), says: “Currently, from large multinationals to SMEs, manufacturers have identified a shortage of skilled labour with the competencies required to support the nuclear programme. This is a significant hindrance to them being able to grow their existing operations in the nuclear market, and a real barrier to new supply chain companies wishing to work in the sector. NSA Nuclear Manufacturing operates on a membership model, with industrial members gaining full access to its specialist skills services. Nuclear Engineering Services (NES), a Tier One member of the Nuclear AMRC, is the first company to sign up. NES specialises in the integrated design, manufacture, assembly, test and commissioning of bespoke solutions for the nuclear decommissioning, new build and defence markets. The NSA Nuclear Manufacturing is based at the Nuclear AMRC in South Yorkshire, at the heart of the UK nuclear manufacturing industry. The NSA Nuclear Manufacturing was formally launched at the Developing the skills for growth conference at AMRC, with a keynote presentation from deputy prime minister Nick Clegg. The event also saw the launch of the new AMRC Training Centre, which will provide apprentice and higher training to companies in advanced manufacturing sectors including nuclear. More on the NSA Nuclear Manufacturing. The Nuclear AMRC is presenting and exhibiting at the the European Nuclear Power Plant Simulation Forum, Europe’s only business conference focused on simulators. It will bring together those who are involved with simulators, training personnel, training managers, operation support managers and anyone with an interest in nuclear power plant simulators or those who develop or use simulation tools for nuclear power plants. 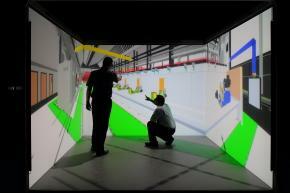 Dr Rab Scott, Nuclear AMRC head of virtual reality and modelling, will give a presentation on how the centre is using virtual environments to support our work in product design, planning, assembly and training.